My sister, Bev, provided invaluable help for the book signings. Late Saturday night I returned from a five-day speaking trip in Illinois and Indiana. Since then I’ve been decompressing and processing. My mind churns with memories and images that are difficult to distill. One thing I know: God’s Spirit amazed me over and over! He equipped introverted-homebody me, who hadn’t been able to prepare as well as control-freak me would have liked, to speak with a confidence I certainly didn’t feel on my own. He revealed the compassionate faith of many dear sisters in Christ who welcomed my biological sister and me with open arms and hearts. God kept us safe while traveling over 1,000 miles. And he floored me when I witnessed his amazing grace working in the lives of men and women inmates. Bev and I left the Pella area on Tuesday morning and arrived at our restful home away from home that evening. For two nights, we stayed in a beautiful condo that provided a quiet haven between speaking engagements. Painted above the headboard of the bed where I slept were the words of Psalm 23:3, “He restoreth my soul.” Providentially, that was also the first verse in my PowerPoint presentation, Soul Rest: Finding Rest in God. From where I lounged on the sofa, I could see through the front window the glowing spire of a nearby church. 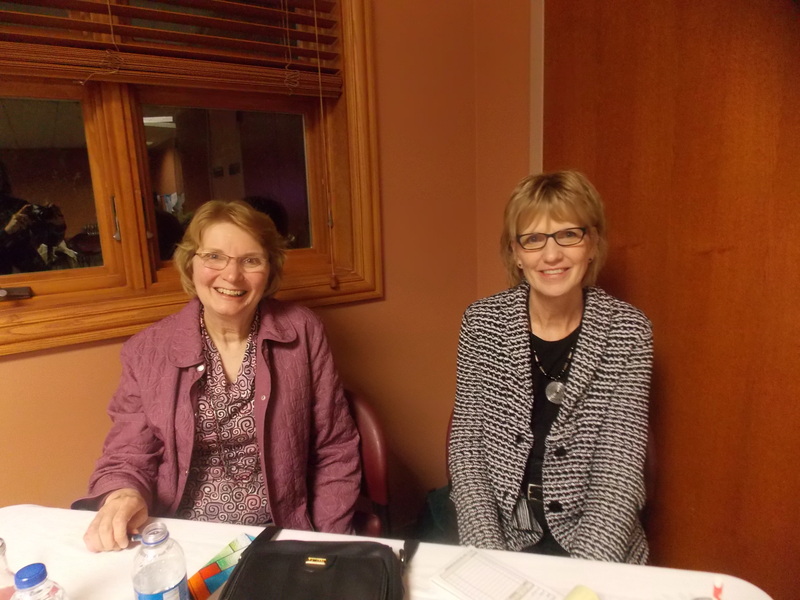 On Wednesday morning, the Heart-to-Heart ladies of Oak Glen URC in Lansing, IL, welcomed us. They helped me get the PowerPoint presentation set up–until the wi-fi was turned off. We sang a few songs until a helpful fellow from the church came and got all the connections set correctly and I was back in PowerPoint business. That morning was a great time of meeting some old friends and many new ones. We had a lovely lunch with a dear, longtime friend. Sweet fellowship with the sisters at Community URC in Schererville, IN. 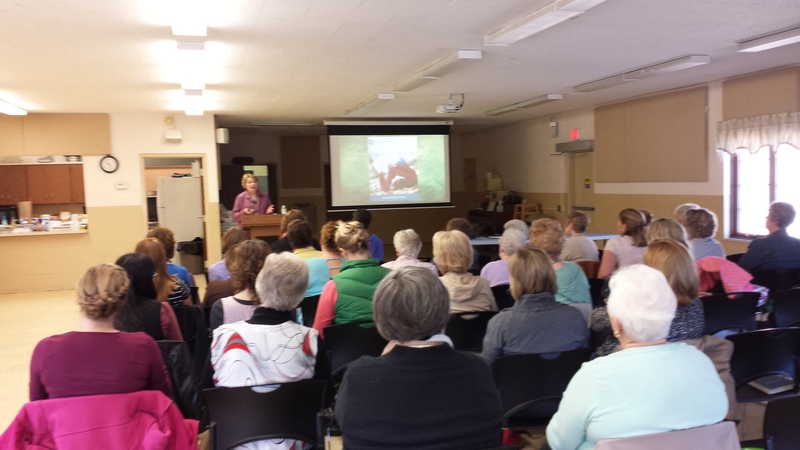 That evening we joined the women at Community URC in Schererville, IN, where an old friend I’d met at many Classis meetings brought in his digital projector and screen. Skillfully-made decorations enhanced the joyful experience of meeting these dear sisters in the Lord. The fellowship was even sweeter than the refreshments. 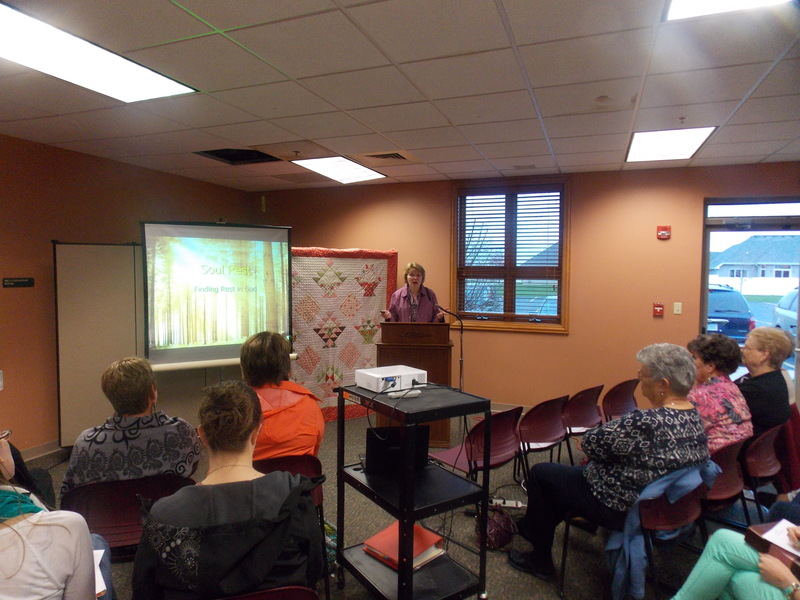 Sharing God’s comfort with women from several churches at New Life CRC in Highland, IN. On Thursday morning, we headed north to Highland, IN, where we found more fellowship at New Life CRC among women from many different churches. The common chord in our hearts, drawing us all together that day was the memory of Jan Robb, who had led Bible studies in various churches and had contacted me about speaking shortly before her tragic death. Through a series of providences, God led me to connect with another woman and brought me to Highland. After a lovely lunch with a dear, new friend, we drove down to DeMotte, IN, and set up at Immanuel URC. What a joy that evening to renew old and kindle new acquaintances, including our mother’s cousin and two delightfully polite 13-year-olds! Meeting my mom’s cousin, Wilma, at Immanuel URC in DeMotte, IN. Friday was a huge day of teaching a writing seminar to the men in Divine Hope Reformed Seminary within the walls of Danville Correctional Center in Danville, IL. What a privilege to witness the Spirit’s work in their changed lives–their hope and joy in Christ! These men were eager to learn and kept me on my teaching toes. They were attentive and polite students, expressing their immense gratitude for the visit and instruction. 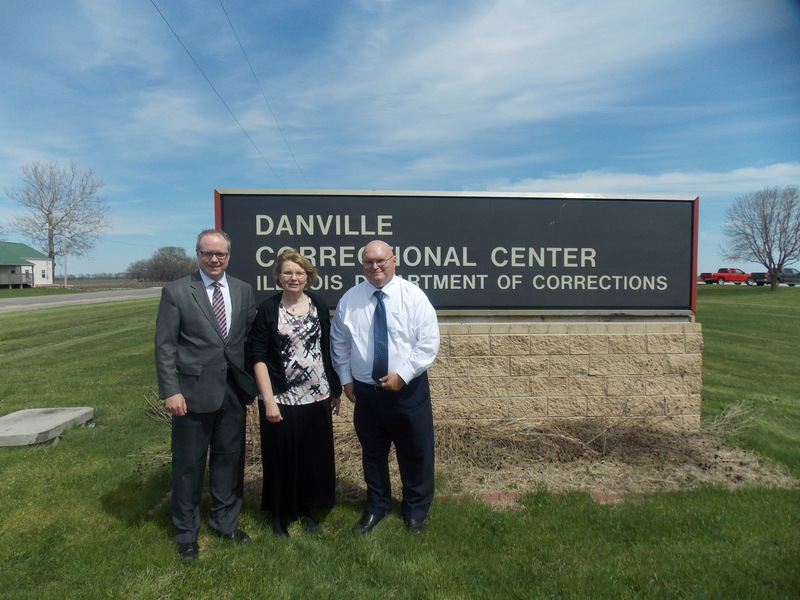 On Friday evening, we arrived at the women’s prison facility in Rockville, IN. 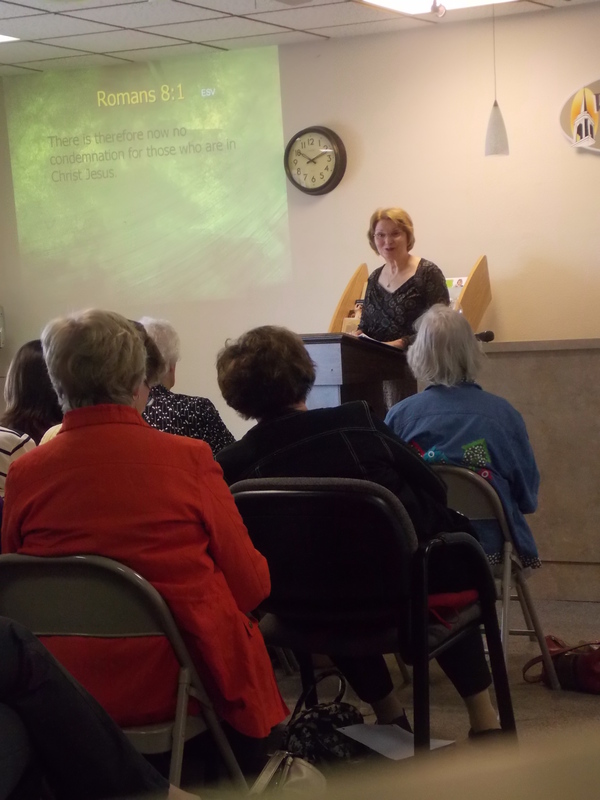 Paula Brummel and Annette Gysen helped me lead book discussions on my devotional, A Month of Sundays: 31 Meditations on Resting on God, which a donor had given to the women who signed up for the Resting in God conference. How incredibly humbling to hear women testify how something I wrote is drawing them closer to God. I was totally overwhelmed that God should choose to use me. Many of the women shared underlined text and how it touched their hearts. God’s grace floors me. With Rev. Nathan Brummel and John Surowiec after teaching a writing seminar at Divine Hope Reformed Seminary in Danville prison in Illinois. On Saturday morning, a “situation” in the prison kept us from being admitted at first. But after about a half hour’s wait, we were permitted to go through the wanding and patting down process before entering the prison. In my initial presentation, I encouraged the women to rest in our Triune God’s steadfast love by trusting in the Father’s sovereignty, believing in the Son’s salvation, and walking in the Spirit’s sanctification. 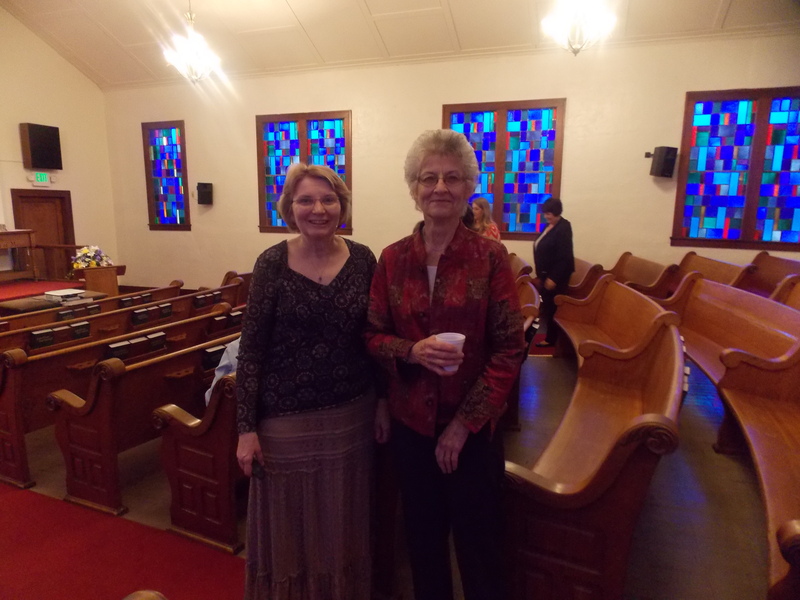 Paula spoke on Sabbath rest, past, present and future. After lunch, Annette discussed resting in God during times of suffering. In my final presentation, I talked about how we need to surrender all to Jesus in submission to his will, in sorrow for our sins, and in selflessness toward others. The conference concluded with all of us women standing and singing Amazing Grace. What an experience! Back in Pella on Sunday morning, the last song during our worship service was Amazing Grace. I sang with tears running down my cheeks, clinging to my husband. All I could see was an image of those women’s glowing faces. It was an exhilarating and exhausting week. Praise God for his Spirit’s work in the churches and in the prisons. In the hearts of church members and prison inmates, who are no different in God’s eyes. That is a FULL week! And yet how wonderful to meet so many new sisters in Christ. Perhaps one day your journey will bring you to Alberta and I will happily take you out for a quiet lunch where I can get to know you face to face. May God bless all your efforts and the work of your hands.